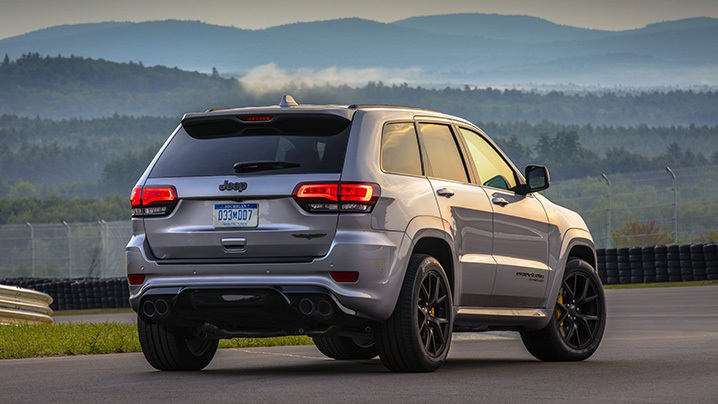 TAMWORTH, New Hampshire – We're tempted to tell you that the 2018 Jeep Grand Cherokee Trackhawk is ridiculous. 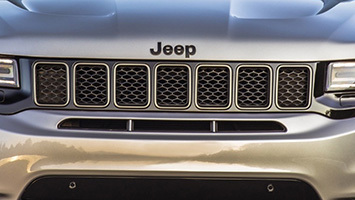 It's borderline frightening to think that we now live in a world where anybody with the money and the gumption can stroll into the nearest Jeep dealership and place an order for a 707-horsepower Hemi-powered Grand Cherokee. Let's put this slice of history into perspective. The original Jeep, the one used by the military, boasted 60 horsepower from the Go Devil four-cylinder engine under the hood. 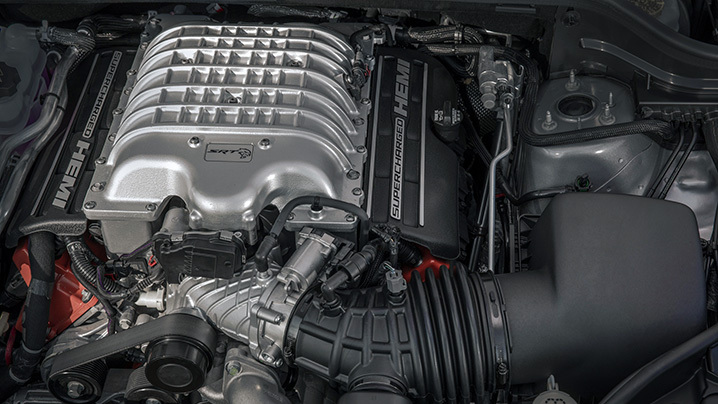 The most powerful version of the muscle car-era 426-cubic-inch Hemi was factory-rated at 425 hp. And even if that legendary powerplant was underrated from the factory, the Grand Cherokee Trackhawk still obliterates it by a couple hundred horses. In an SUV. Seven-hundred-horsepower sport utility vehicle doesn't exactly roll off the tongue, does it? And conventional wisdom says it shouldn't. But we're here to tell you otherwise. 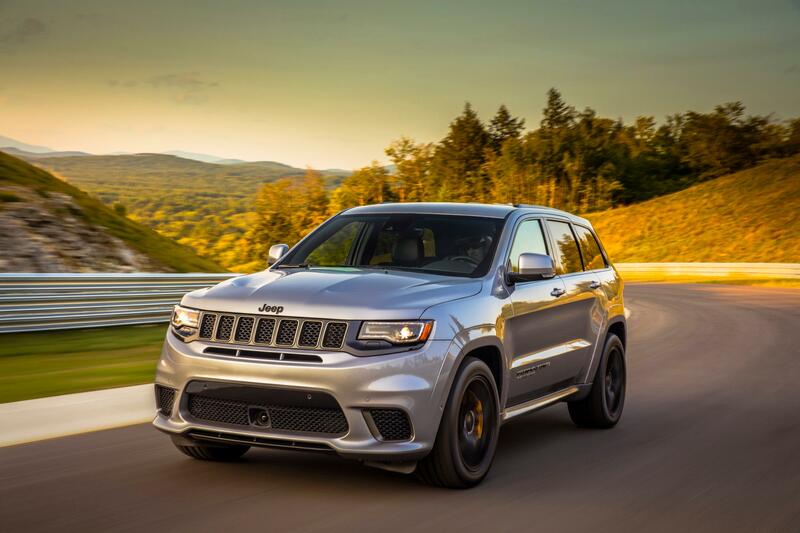 After driving the Trackhawk in and around the streets of Portland, Maine, and taking it to Club Motorsports in New Hampshire, we're convinced that Jeep and SRT engineers have managed to defy physics and reason. The Trackhawk isn't just fast, it's also manageable. Subdued, even – at least when you want it to be. Put the hammer down, summon the nearly demonic power of supercharged combustion, and all hell breaks loose. But the tires don't. With launch control engaged and with the programmable engine speed properly chosen, the all-wheel-drive Trackhawk rockets to 60 miles per hour in just 3.5 seconds, over and over and over again. No drama, no wheelspin, just g-force, pressing you and four close friends into the backs of your seats. It's addictive, and the only penalty is single-digit fuel mileage. But we'll wager a guess that anyone shopping for a Trackhawk isn't much concerned about its drinking problem. The only proper way to experience the Trackhawk's acceleration is from inside. But, to give you an idea of its speed and power, check out the videos below. Stick around for a walkaround both inside and out, and for a look under the hood. Jeep had to make a few small changes to the well-known 6.2-liter supercharged Hellcat V8 engine to shoehorn it under the hood of a Grand Cherokee. The oil pan is reshaped and baffled, the intercooler is modified, and the exhaust manifolds are new. The result is a reduction in torque from 650 pound-feet in Dodge Hellcat models to 645 in the Jeep, but we wouldn't worry about that. Keep your foot planted for 11.6 seconds and you'll have crossed the quarter-mile threshold. We hit 120 miles per hour on the long straight at Club Motorsports, but if we'd have had a longer runway, we have zero doubt that the Trackhawk would hit its claimed 180-mph top speed. We feel obligated to remind you, again, that the Trackhawk is an SUV, not a sports car. 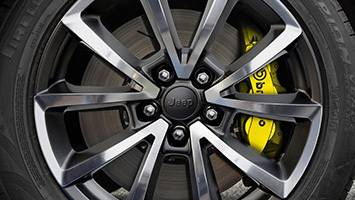 Good thing, then, that the six-piston Brembo calipers and 15.75-inch rotors at the front and four-piston calipers with 13.78-inch rotors at the rear are the largest ever fitted to a Jeep. Mash those brakes and the 5,363-pound Trackhawk will come to a stop from 60 in just 114 feet. It probably goes without saying, but we'll say it anyway. Nobody is going to take the Trackhawk off-road. 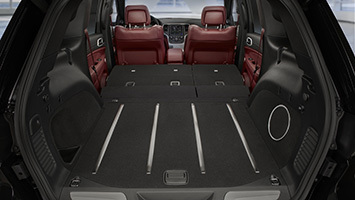 Jeep knows this and removed unnecessary things like a low-range transfer case and mud or rock modes from the Selec-Track terrain management system. 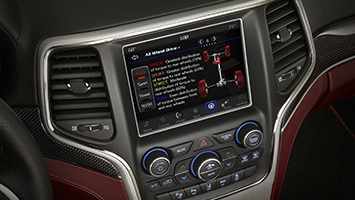 That leaves Auto, Sport, Track, Snow and Tow modes to choose from. The Grand Cherokee's Quadra-Trac on-demand four-wheel drive system is beefed up to handle the hellacious power of the supercharged engine with new drive shafts, a stronger rear axle, forged steel chain sprockets and a stronger differential housing. An eight-speed automatic transmission is the only gearbox available. We have no qualms with the powertrain, or Jeep's claim that the Grand Cherokee Trackhawk is the most powerful and quickest SUV ever made. But we do wish the steering ratio was quicker than 16.5:1. Too often we found ourselves sawing at the wheel to keep the Trackhawk under control. A variable-ratio unit would definitely help. Once it's pointed in the proper direction, Jeep's skill in programming all-wheel-drive systems shines. There's not much drama in how the Trackhawk handles the twisties, despite the huge lump under its hood. Grippy P295/45ZR20 tires help, but the overall sense of plantedness and the lack of body roll initially comes as a surprise. 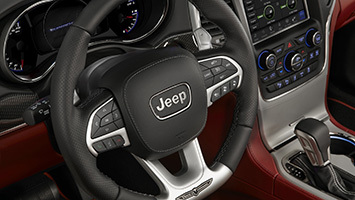 Jeep fitted the Trackhawk with a steering wheel that's nice and meaty at every location your hands want to grab. Paddle shifters on the back of the wheel work well, but the transmission's shift logic is good enough that we mostly didn't bother with them. The seats in the Trackhawk are comfortable, but owners who plan to use their Jeeps at the racetrack will probably wish for more aggressive bolstering. There aren't a lot of obvious exterior changes to separate the Trackhawk from the regular-grade Grand Cherokee SRT. 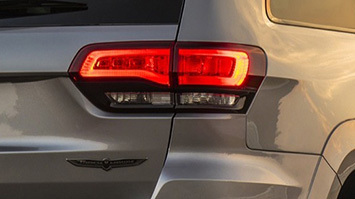 Badging is different, of course, and so are the exhaust tips at the rear. 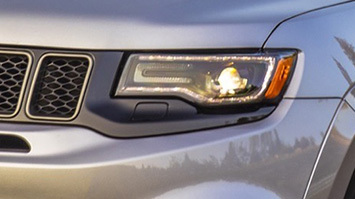 Up front is a new fascia made most noticeable by the loss of its fog lamps, which are replaced with air intakes to help keep things cool under the hood. Jeep dropped the ride height of the Trackhawk by an inch, and we think the SUV looks best with the optional flat-black forged 20-inch wheels fitted with Pirelli P-Zero three-season tires. A backup set of wheels with proper winter tires are likely an absolute necessity in snowy climates. We doubt many owners will be towing ultra heavy loads with the Trackhawk, but its 7,200-pound max rating certainly allows for trailers, jet skis or dirt bikes. With a starting price of $86,995, the 2018 Jeep Grand Cherokee Trackhawk isn't cheap. But it's less expensive, quicker and more powerful than the BMW X5M or Porsche Cayenne Turbo S. It's also $2,000 dearer than the 840-horsepower Dodge Demon. But the Demon is a one-trick pony, and the Trackhawk is most definitely not. In fact, Jeep's latest super-powerful utility vehicle may be the perfect automobile for anyone who desires practical performance. We went into our first stint in the Trackhawk thinking it was ridiculous. And it is, but not for the reason we had thought. What's really crazy is how well the thing works.